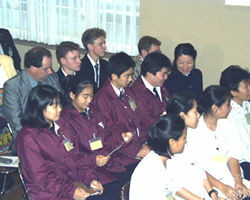 World School International Forum '99 had started at Katsuura International Training Center on October 26, 1999. This year they have 22 schools from 19 countries and areas from all over the world including three new schools, which are Pretoria, Iasi and Montreal. The participants will discuss about the curricurum for 21st century. The participants had a good time each other sharing their own information, such as their names, the first impression about Japan and so on. It halped them understand each other easily.